New luck, good health or work for new prosperity. 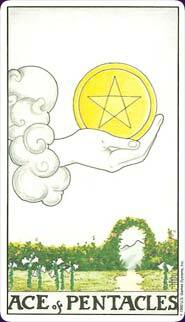 There is no desire to burn, flow or fly in the Ace of Pentacles; here is a physical need to be grounded, to make, build and touch. Like a seed in the ground, there is a desire to sprout roots and just become. The pentacle is taken in hand, and, for now, the querent wants only to have it solidly in his pocket. Learn the Ace of Pentacles tarot card meaning and the rest of the card meanings, symbols and stories in our eBook.